In it he extols the virtues of an open ecosystem winning out in a fragmented world, perhaps not unlike the PC and Mac market dynamics of twenty years ago. Narayen cites Flash as a key differentiator and unifier of that fragmentation. Regarding Apple, he says it’s a non-issue in that they’ve made their decision, although they did recently relax some restrictions for Flash apps. As evidence of growing momentum, he cites 10 million Flash-based devices (smartphones, tablets, and consumer electronic devices) having shipped in the latter half of 2010, essentially since the mobile-attuned Flash Player 10.1 was officially released. Victoria Barret, Forbes Magazine: Last spring, Steve Jobs made a very public case against Flash on the iPhone and now the iPad – is there any update there? Shantanu Narayen, Adobe Systems: I think it’s important to really remember what’s happening in the industry, which is we’re seeing a huge explosion of new devices. It’s actually about the future of the Internet and how content and applications are going to be delivered across the Internet. Adobe believes in it being an open system that’s going to prevail over time, and so what we’ve been doing is working with companies like Google with Android, and RIM with the PlayBook, Nokia, and HP. We want basically to do two things: For our content customers – we want to make sure that we provide them the best tools to deliver content across every one of these platforms, and for consumers we want to deliver the best Flash platform to be able to consume that content. I think it’s a non-issue with Apple in that they’ve made their decision. But we’re just all about creating content and enabling people to consume it. Victoria Barret: A lot has changed even is less than a year now, and Apple has had a remarkable first-mover advantage. Do you think we are at the point where that first-mover advantage is no longer viable and they need to sort of loosen up a little bit – control of the iPhone and iPad environments? Shantanu Narayen: Well, I think when you go to CES which I attended recently and you look at the proliferation of devices, it’s clear that Android – that’s bet on open system – is seeing remarkable adoption, and I think it’s again going to be about, do open ecosystems triumph in the end? Because you bring innovation of an entire ecosystem and that’s certainly the viewpoint that Adobe takes. Adobe actually allows our publishers right now to create both content for the iDevices as well as [since] Apple reduced their restrictions, we can actually provide applications. So you can build an application today in Flash and then convert it onto an iDevice – so we’ve made progress with the Apple platform as well. Victoria Barret: How do you see this playing out in the next… let’s give you long timeframe – 5 years? Victoria Barret: It creates work. Shantanu Narayen: Exactly, and what you want to do is just focus on your brand and focus on the customer and how can you get the most compelling content out, to as broad a customer base as possible. And so I think the way it plays out is, as fragment­ation occurs, Adobe has to step up and deliver the best tools in order to be able to help you with that authoring problem that you do have today. Victoria Barret: The world will always be fragmented, we know that. Shantanu Narayen: That’s correct. On the other hand, for consumption – the more we can provide our technology on multiple devices, we’ve had over 10 million smartphones already in the latter half of 2010 shipping with Flash. So the more we provide this really compelling, hi-fidelity runtime, we’re assuring you of the fact that your content will be consumed in the way in which you intended. So, I think it is going to be frag­mented, I think you are going to see a few platforms really gain disproportionate share, and I do think open ecosystems win out over the long run. If you use Adobe products, please consider subscribing to our RSS feed or following us on Twitter or Facebook… You can also enter your email and new articles will be sent directly to your inbox. The only fragmentation we are talking about is Google’s. His statement is synonymous to saying in a capitalist world, socialism will win. Put it another way, if we give something to everyone for free, they will try to make money off of it. That’s the nature of business. Google may be angelic in giving Android for free, but the carriers and manufacturers will want to make money off of it, if it means limiting updates to phones and not supporting them so quickly. 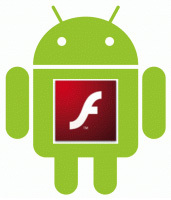 As for Flash, im sure Adobe wants to get everyone on-board because they want a platform like Flash (closed in itself) to allow companies to advertise on it, to go wild even if it means sucking more juice out of the phone. After all, thats what having compulsory widgets from your carrier on a droid does. Hi Doron, thanks very much for your thoughts. The fragmentation Narayen is referring to is both within and across mobile platforms… Definitely there is some level of fragmentation within Android, but there is greater fragmenta­tion across smartphone operating systems, such as the ones he refers to (Google, Nokia, RIM, Microsoft, HP/Palm, etc). So Adobe sees Flash as providing a uniform development base across most of those, similar to how it happens in the desktop space. As for why Android is free, it’s doubtlessly for the same reasons that Google search itself is free – Google makes money off of paid ads on their search engine result pages, and naturally wants to see this spread as far and wide as possible. So Android more than pays for itself standalone as contrasted to a company like Microsoft, who charges upfront for Windows Phone 7 and has led some observers to conclude that makes the WP7 platform nonviable against a free and popular alternative. Will win? What does that mean? Has the Mac OS “lost” against Windows? Has Linux “won” against Windows? You know, Adobe could have gone another way with the whole Flash/iPhone thing which is to have Flash compile to Objective-C code like other iOS tools do. Hello David, thank you for your comments. By “winning” in this case he likely means gaining the largest market share over time – although clearly in this new space (mobile device operating systems) there are multiple competing major platforms with much to still play out. Some liken the current iOS vs. Android battle to the old days of Mac (first on the scene, but “closed”) vs. PC (arguably not as good, but open). In the current match-up, both major platforms are excellent and each have their strengths and supporters. And then of course there’s RIM, Windows Phone 7, and the others in the mix – so it should be a fascinating horse race to watch. Adobe CEO: "It's a Non-Issue with Apple; Open Ecosystems Will Win"